About two years back Porcelain: A Gothic Fairytale hit the shelves in the UK, creating quite a stir. It was new, it was fresh and most definitely it was entertaining. As someone who has read it, I can wholeheartedly recommend it (I take no responsibility for the impatience you’ll feel when you’re done and you learn that you still have a long wait for the next two issues though). Today marks the release date of the book in French, by Editions Delcourt. Take a peak at the press-release, and if you’re French, francophone or francophile, do yourself a favour, go out and get it..
Éditions Delcourt and Improper Books are delighted to announce PORCELAINE: 01 – GAMINE, the first French language volume of Benjamin Read and Chris Wildgoose’s Porcelain trilogy, is being released today, 17th September 2014. Porcelain first came to the attention of Delcourt in 2012 at the Thought Bubble comic festival in Leeds, when Thierry Mornet, Delcourt’s Editor in Chief, discovered Benjamin and Chris’ work from a free preview published by Improper Books. 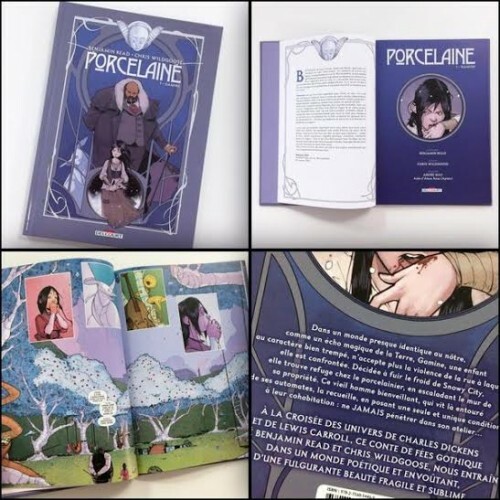 As the leading independent comic publisher in France, and with a strong record of adapting US comics, Delcourt’s passion and expertise were a natural fit for the French language edition of Porcelain: A Gothic Fairy Tale and its sequels. As part of the three-book deal, two sequels are currently in development; with release of the French editions scheduled for 2015 and 2016. Subtitled BONE CHINA and IVORY TOWER, the sequels will explore the aftermath of the first book and the consequences of Child’s choices. Written by Benjamin Read and illustrated by Chris Wildgoose, with colours by André May, and lettering by Jim Campbell, Porcelain is set within a world that’s a darkly magical echo of our own. It follows the urchin, Child, as she steals into the Porcelain Maker’s garden. Captured by his alchymical porcelain automata, she charms her way into his life and he becomes the father she never had. He has only one rule; she must never, ever, open the workshop door.